Chickens are fun and easy to care for – and the steady supply of fresh eggs is an added bonus. I set out to learn how to make a chicken coop that would be secure, low-cost, easy to build, light enough to relocate easily and scaled to fit in small backyards. The design in this chicken coop how-to meets all the necessary criteria. It’s a simple chicken coop with a portable pen and henhouse that will meet the needs of a small group of backyard poultry. Intended for three or four hens, this inexpensive poultry housing costs approximately $100 and can be constructed in a few hours from standard welded wire fencing. In this chicken coop design, a barn-style plastic doghouse operates as a henhouse that is located inside the wire pen. 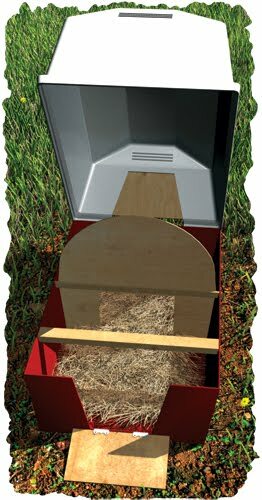 The pen and house is lightweight and easy to move to a new site as needed, keeping your birds safe and letting them enjoy clean, fresh pasture (or set them over garden beds to assist in fertilizing and pest control). tall as or taller than the doghouse. enough fencing to construct sides and doors for one 3-foot-by-10-foot pen. 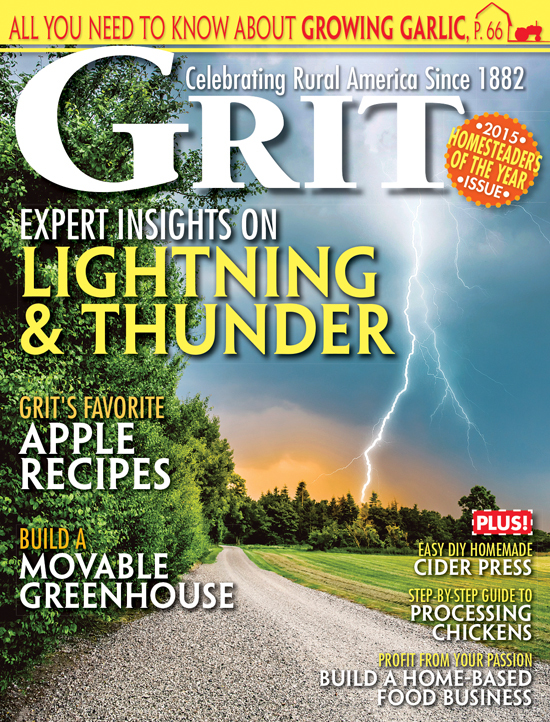 throughout, but the 2-inch-by-4-inch is adequate, plus it’s lighter and less costly. Two or three boxes of “hog rings” and the particular pliers to pinch them closed. 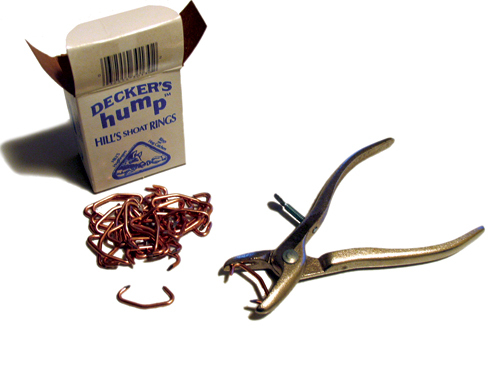 J-clips used for making rabbit hutches will also work – be sure to get the matching pliers. will allow you to easily cut the wire fencing. Step 1: Bend the 1-inch-by-2-inch-mesh fencing to create the sides of the 3-foot-by-10-foot pen. Step 3: Make an additional 10-foot section as described above, turn the chicken pen over and install the second section. Step 4: To make two door openings – one at one end used to gather eggs from the henhouse and slide the house out for cleaning, and the second door at the other end to allow tending to the birds’ food and water containers – cut sections of wire from each end of the pen to make openings tall and wide enough for the house to slide in and out easily. Twist back all the sharp wire ends. Step 5: Construct the doors – two 3-foot-by-1 1/2-foot sections of the 1-inch-by-2-inch-mesh fencing that hinge up from the bottom and down from the top (use the hog rings to design the “hinges”); the top and bottom sections will overlap 6 inches in the middle. This door design allows you to open the top flap to reach in for eggs, or open both the top and bottom flaps if you want to slide the moveable henhouse out. Use bungee cords or other fasteners you have to secure the door flaps. Step 6: To use the barn-style doghouse, first file off the tabs that secure the roof section to the bottom so you can easily remove the roof when you want to change the bedding. 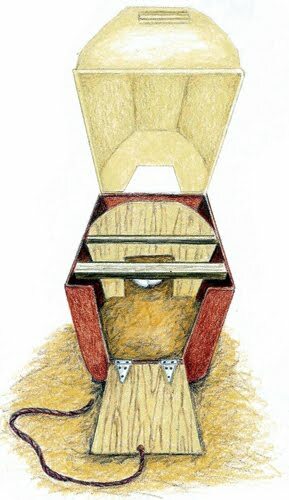 Then insert a 1-inch-by-2-inch board to be used as a roost at the top edge of the bottom section, and install a thin plywood “wall” to a second crosspiece toward the rear of the coop, with a hole cut in it so the hens can lay eggs in the “back room.” Assemble the top section of the doghouse onto the bottom backwards, so there is a large opening in the front and a small, higher opening facing the rear. Step 7: Lastly, trace the shape of the front and rear henhouse openings, make plywood doors to fit and hinge them to the openings. I constructed the front door hinge downward and attached a cord to the upper edge so I can easily pull the cord up to close the door; and I installed a small snap fastener at the end of the cord so opening and closing the door takes about five seconds! I discovered the hard way that groups of raccoons can scare young birds out of the house, and reach through the wire and kill them! So, even though the birds naturally head into the house every evening to roost, it’s still a smart idea to close the door each night. Chickens like to roost! Can you find a way to make this higher so they can do that?